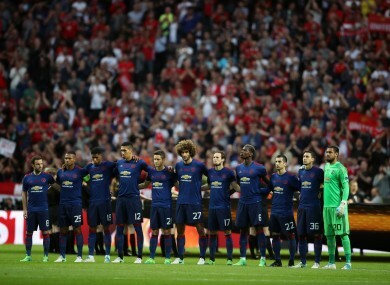 The two teams stood around the centre circle at Stockholm’s Friends Arena with their heads bowed. Manchester United players show their respects to the victims of the Manchester terror attack before the UEFA Europa League Final at the Friends Arena in Stockholm. PLAYERS FROM AJAX and Manchester United observed a minute of reflection prior to Wednesday’s Europa League final in memory of the victims of Monday’s terror attack in Manchester. The two teams stood around the centre circle at Stockholm’s Friends Arena with their heads bowed during a brief period of silence, United’s players sporting black armbands, before fans of both sides burst into applause. Twenty-two people were killed and dozens injured after a suicide bomber targeted concert-goers leaving a performance by the American pop star Ariana Grande at Manchester Arena. “We tried our best to focus on the game. It is our job,” United manager Jose Mourinho told BT Sport before the match. United cancelled their pre-match press conference on Tuesday, with Mourinho saying in a Twitter post that he and his players were struggling not to think about the tragedy. Ajax coach Peter Bosz said the match “doesn’t have the glow it should have” following the attack. United’s fans inside the stadium chanted “Manchester, Manchester, Manchester!” and unfurled a long red banner that read: “Manchester — a city united”. European governing body UEFA said it had “no specific intelligence” suggesting the final would be targeted by attacks. Security arrangements had already been ramped up following last month’s truck attack in Stockholm, which claimed five lives and injured around 15 people. Email “Watch: Silence, applause as United and Ajax honour Manchester victims”. Feedback on “Watch: Silence, applause as United and Ajax honour Manchester victims”.